Australian artist William Rose was born in 1929 in the industrial suburb of Carrington, NSW. 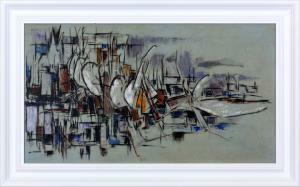 After a few sojourns at sea and in factories, Rose undertook art studies at Newcastle Technical College and held his first exhibition in Newcastle in 1954. 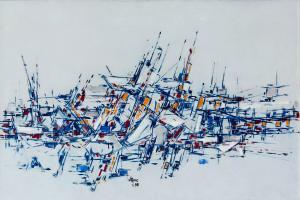 After moving to Sydney where he furthered his artistic education, Rose became a member of what conservative art historian Bernard Smith described as 'the Victoria Street Group' of Sydney abstract expressionists. 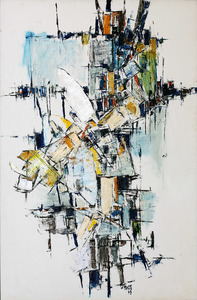 He organised the influential exhibition Directions 1 with fellow abstract artists John Olsen, John Passmore, Eric Smith and Robert Klippel in 1956. 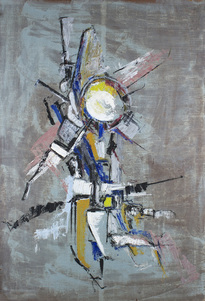 Although Rose was included in the Direction 1, his work demonstrates marked differences from the customary abstract expressionism – which is perhaps why he described himself as a constructivist. Rose’s distinctive powerful cross-hatched grids floating over a white ground were the mainstay of his painting throughout his career. 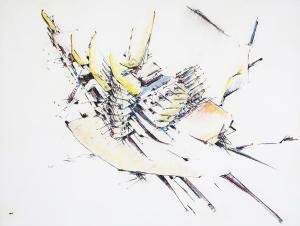 The artist’s drawings and paintings are uncompromising and controlled quests in the composition of abstract space. The artist gradually moved away from his early use of vertical and horizontal structure to his characteristic diagonally slated grids, injecting his later works with a fresh, vibrant rhythm. Rose’s abiding passion for classical music underscored his paintings as harmoniously as it resonated throughout his studio as he worked. Throughout the early 1960s, Rose’s work was represented in significant national exhibitions, including Recent Australian Painting, Whitechapel Gallery, London in 1961 and in 1963 in Antipodean Vision, Tate Gallery, London. From 1957 to 1991, Rose held about 20 solo exhibitions in Melbourne, Sydney, in Everson Museum of Art, Syracuse, New York in 1982 and Lewers Bequest, Penrith Regional Art Gallery in 1991. William Rose’s work is widely represented across major Australian art galleries including National Gallery Australia, Art Gallery of New South Wales, Art Gallery of South Australia, Art Gallery of Western Australia, National Gallery of Victoria, Queensland Art Gallery, Museums and Art Galleries of the Northern Territory, Queen Victoria Art Gallery and Museum and Tasmanian Museum and Art Gallery. The artist’s work is also regionally represented at Newcastle Regional Gallery and Rockhampton Regional Gallery. Rose's drawings and paintings are relentless and disciplined pursuits in the composition of abstract space. Link to William Rose Artworks in the Art Gallery NSW collection.